Baltimore City officials say they have started to carry out an autopsy on a local man who died on Sunday. This comes a week after Freddie Gray’s spine was severed while he was being held in police custody. Investigators said during a press conference on Monday that they plan on wrapping up an investigation next week concerning Gray’s death, with results from the probe expected by May 1. The findings will be forwarded to the State Attorney’s Office, according to Baltimore officials, which will subsequently rule on the case. A third review board will also examine the matter “to take an honest look at our investigation as a whole,” Police Commissioner Anthony Batts said on Monday. Despite the investigation moving head at speed, city officials say they are at a loss to explain how Gray sustained his injuries. Officers from the Baltimore Police Department arrested Gray, 27, on the morning of Sunday, April 12. He had "fled unprovoked upon noticing [a] police presence,” according to an official report of the incident. This prompted three BPD bike cops to give chase. The suspect was eventually apprehended and taken into custody after police recovered a switchblade knife from his trousers. The arrest was conducted "without force or incident,” according to the official police report, but cell phone footage of the ordeal, which surfaced online soon after the incident, showed Gray was screaming as he was hauled off into a wagon. It was later revealed that, while in police custody, Gray’s spinal cord was severed. 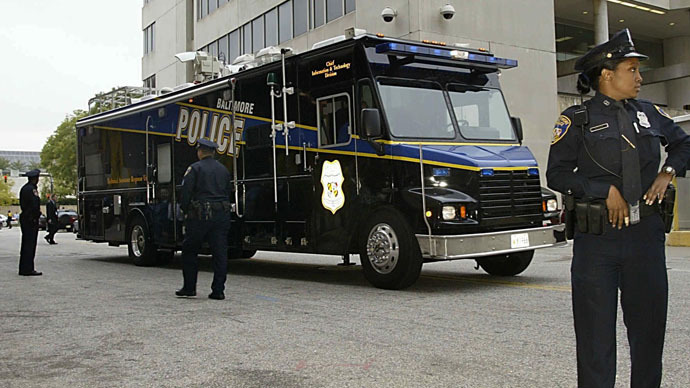 "During transport to Western District via wagon transport, the defendant suffered a medical emergency and was immediately transported to Shock Trauma via [a] medic,” Garrett Miller, the arresting officer, wrote in the report. "While in police custody, his spine was 80 percent severed at his neck." William Murphy, an attorney for the Gray family, had said previously. Gray passed away on April 19. On Monday afternoon, city officials admitted the 27 year-old had requested an inhaler while in police custody, but that calls for medical assistance were not made for another 42 minutes. Medical staff were then dispatched to the scene to take Gray to a local hospital, where he slipped into a coma and eventually died. “We know the injuries that Mr. Gray sustained. We know the final outcome of Mr. Gray…What we don’t have at this point is how Mr. Gray sustained those injuries,” BPD Deputy Commissioner Jerry Rodriguez said at a media briefing on Monday. “It’s clear that what happened, happened inside of the van,” Mayor Stephanie Rawlings said on Monday. Commissioner Batts added that officials have requested surveillance camera footage taken from the front of the wagon Gray was riding in, when he suffered his medical emergency. Ahead of the press conference, protesters held a rally in downtown Baltimore to demonstrate against the latest of a number of cases of perceived police brutality, which have proved to be fatal. “The Voting Rights Act of 1965 was not passed until Bloody Sunday transpired weeks, months before,” Cortly ‘CD’ Witherspoon Sr., the president of Baltimore’s Southern Christian Leadership Conference, told RT during Monday’s protest. “We have to do the same thing here. So we support what happened in New York, supported the family of Eric Garner in that particular atrocity. We went to Ferguson and we stood with the family and friends of Michael Brown, where they stood up for justice. “I think, what Baltimore really needs is someone to come out and advocate for this place,” Tiffany, a mother of three, told RT at Monday’s protest. “There needs [to be] a resolution here in Baltimore. It needs to begin with our officers; it needs to begin with our mayors. It needs to begin with all families, not just one family. When we all stand together, we stand together and we don’t divide,” she added. Rawlings told reporters on Monday that she’s upset that Baltimore city officials have again found themselves struggling to explain the death of a young man. Six officers have been suspended with pay pending the results of an investigation, Batts said. Meanwhile, the commissioner has ordered a number of BPD policies to be reviewed and rewritten, which will come into effect immediately. These include those concerning transportation procedures for detainees and policies regarding people in custody requiring medical attention. “Anytime someone requests medical attention in any context, immediately we are to respond to that,” Batts said.